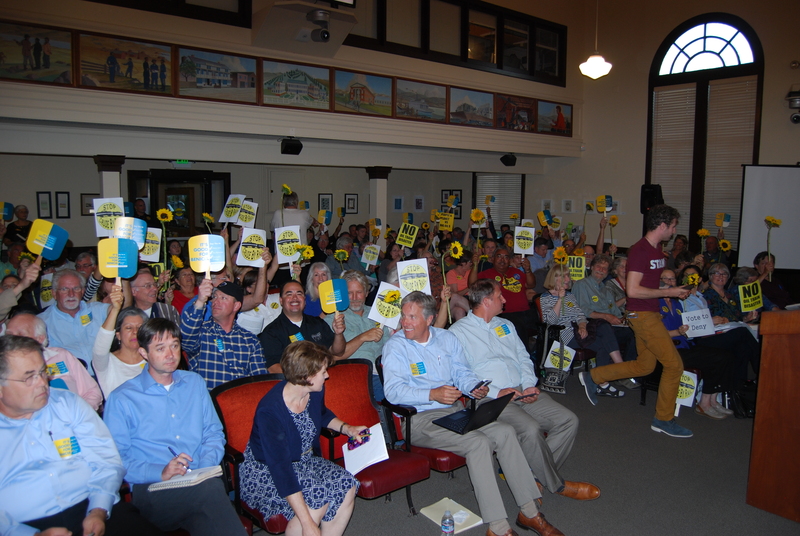 Benicia City Council has unanimously denied a use permit for the controversial Valero Crude-By-Rail project, citing a federal board decision as well as a June 3 derailment that spilled 42,000 gallons of crude oil and caused a fire that burned 14 hours. But the matter didn’t end Tuesday with the vote. The Council has asked its legal staff to rephrase its findings in a document the panel will see for approval Oct. 4. Valero Benicia Refinery will have 30 days after that to decide how to proceed. Valero had appealed to the Council a Feb. 11 Planning Commission decision to deny both an environmental report on the project as well as the use permit the refinery had sought. After several meetings, several members of the Council said they needed answers to their questions, some posed by constituents, before they were ready to vote. Meanwhile, Valero sought a declaratory order from the federal Surface Transportation Board, and the Council agreed to wait until Tuesday to give the Board time to respond. Because Valero isn’t a rail carrier and its employees, rather than those from UP, would be offloading the crude into the refinery, the board said the Planning Commission’s decision had not tried to regulate the railroad. “If the offloading facility were eventually to be constructed but the EIR or land use permit or both, including mitigation conditions unreasonably interfering with UP’s future operations to the facility, any attempt to enforce such mitigation measures would be preempted,” the Board’s decision said. Scott Lichtig, California’s deputy attorney general, expressed a similar opinion in his April 14 letter. “Because the project applicant Valero is not a rail carrier and not acting pursuant to STB authorization, ICCTA (Interstate Commerce Commission Termination Act) simply has no application to Valero and its proposed refinery upgrades,” he wrote. Councilmember Christina Strawbridge, who said she had been doing her own “homework” about the matter and who had been carefully weighing both sides, said it was a derailment in late spring that made her reject the refinery’s application. Later, the other councilmembers joined her in voting against the refinery’s project. The Council decision is the latest step in the project that proposed extending Union Pacific Railroad track into Valero Benicia Refinery land so than up to 70,000 barrels of oil could be brought in daily by train rather than by tanker ships. The refinery, which produces about 10 percent of the gasoline consumed in California, originally applied for the use permit in late 2012. It not only proposed the rail extension, but also replacing and moving tank farm dikes and a concrete berm and moving underground infrastructure. The project also called for new roadwork. A mitigated negative declaration was written and circulated between May 30 and July 30, 2013, but the city decided that document wasn’t thorough enough to meet California Environmental Quality Act requirements for such a project and ordered a draft Environmental Impact Report (DEIR) instead. That document was circulated between June 17 and Sept. 15, 2014. After hearings and public comments, that report was revised and circulated Aug. 31 to Oct. 30, 2015, and a final environmental report was given public airing this year at Benicia Planning Commission meetings Feb. 8-11. During that time, those who opposed the project citing environmental concerns staged protests, including walks to the five Bay Area refineries on both sides of the Carquinez Strait. They argued that a derailment could damage Suisun Marsh, sensitive lands, such as Sulphur Springs Creek, the marshland between Benicia Industrial Park and the Carquinez Strait near Valero’s property and small and large towns next to tracks uprail from Benicia. Detractors also insisted that the project would affect Benicia Industrial Park traffic, particularly on Park Road and ramps on Interstate-680. They cited nearly two dozen train derailments, in particular the July 6, 2013, Lac-Megantic tragedy in which a runaway unattended Montreal, Maine and Atlantic (MMA) Railway train loaded with Bakken Formation sweet crude oil overturned in the small Quebec city. During the derailment, the fuel caught fire and exploded, killing 47 and destroying 30 buildings. Union Pacific and Valero representatives stressed UP’s safety record. UP spokespersons said the railroad has stronger safety practices that, among other things, requires employees to remain with an idling train. The refinery promised it would use improved, reinforced rail cars to carry its crude blend. Refinery emergency personnel trained with Benicia municipal emergency responders to learn about the rail cars’ configuration. Supporters reminded the Council that Valero employs about 500, and backs community projects. In addition, its projects mean jobs, not only at the refinery but for contracted industrial workers. They also worried that denial of the project might cause the company to close the refinery, which could harm Benicia’s economy. Valero sales and utility user taxes represents more than 20 percent of Benicia’s General Fund. Train and refinery spokespersons kept reminding the Council that because railroad operations are part of interstate commerce, they are under federal regulation, not local control. Then a train, traveling below the area’s speed limit, derailed June 3 near the Oregon-Washington border. Although the Union Pacific locomotive was pulling the improved oil cars, the accident spilled 42,000 gallons of crude rail and ignited a fire that lasted 14 days. That began raising new questions about the safety of the reinforced tank cars and Union Pacific’s track inspection methods. Federal investigators said Union Pacific was to blame, since it didn’t find broken bolts along the track, although a UP spokesperson, Justin Jacobs, had said the railroad’s May 31 inspection had detected no broken or damaged bolts. During the long consideration of the divisive issue, Councilmembers themselves found themselves under fire. In previous months, Mayor Elizabeth Patterson, who sent emails about her personal findings about related matters, had her “e-alerts” and her objectivity questioned. Tuesday night, Councilmember Alan Schwartzman responded to a recent Benicia Herald letter from project opponent Andres Soto, who had suggested Schwartzman had taken Valero money for his campaign. Schwartzman denied the accusation and criticized Soto’s behavior at past meetings. ”It’s disrespectful,” he said. Councilmember Mark Hughes supported Schwartzman, saying he, too, had had his integrity questioned. “Show a reasonable level of respect,” he urged, adding that Benicians didn’t like that style of campaigning. But in Tuesday’s vote, they were unanimous. After Councilmember Tom Campbell moved to deny the use permit, Councilmember Christina Strawbridge described the depth of her own research of various sides of the issue. What finally led her to oppose the permit was the June derailment and fire in Oregon. Saying others, including those voting on the Phillips 66 Santa Maria rail extension, were waiting to see how Benicia would vote, she said railroads and those regulating them weren’t addressing derailments. “This is a safety issue,” she said, adding that she would vote to deny the use permit. Hughes said he agreed with the Surface Transportation Board’s guidance that the city couldn’t address railroad operations. He observed there was no such thing as a perfectly safe project. He said risk management consisted of looking at the probability something bad would happen, then at the consequences resulting from that happenstance. Given UP’s and Valero’s safety record, especially the refinery’s plant-wide culture of safety, Hughes suggested the chance of a catastrophe was low. However, the consequences of an incident made him uncomfortable. “There is too much uncertainty for me,” he said. The recent derailment gave him a signal. Patterson said she, too, had made an extensive study of the matter, and said she was vilified when she tried to share her research. She said she had concerns about who would pay for a disaster cleanup, and worried how it would affect the city’s small businesses. “I could not certify a flawed EIR,” she said, suggesting the Council deny the appeal and approve its findings at a future meeting. In addition, she asked city staff to urge state and federal regulators to improve the way they regulate rail safety. “That’s exactly what I want to do,” Campbell said. If Valero’s crude-by-rail, or CBR, project goes through, it will do irreparable damage to Benicia. If the three councilmembers—Mark Hughes, Christina Strawbridge and Alan Schwartzman— continue their support for the project, they will do an extraordinary disservice to the city. I respect those who work on behalf of local government; however, in this case, the legacies of three pro-Valero councilmembers will be that when Benicia needed them, they stood down. They just didn’t have the vision or the ability to do what is right and best for the city. While the same can be said for numerous elected officials in other American small towns, particularly those dominated by a fossil fuel company, it’s a painful thing to witness. What makes Benicia’s situation more painful, is that the city is gifted with a bright and forward thinking mayor and is nestled on the edge of the most innovative and financially robust center in the world. Yet, the pro-Valero majority on the council mirrors the city’s self-inflicted company town identity. This fossil fuel dependence holds the city back from partaking in the Bay Area’s knowledge-based economy and its prosperity. The company town malignancy is intensified by a remarkable and insulating geography that creates the city’s beauty. The town has an idyllic and picturesque quality that is enhanced by a touch of eccentricity and bohemian romanticism left over from the halcyon days of the Gold Rush. This combination allows for a complacency in the social milieu that is on the one hand charming, but on the other, remarkably short-sighted. In fact, it’s just plain dumb, since it allows for the tacit acceptance of the status quo and masks the reality that problems are coming and action needs to be taken. For a half-century, Benicia has allowed the refinery to prosper, hardly inhibiting its use of the atmosphere as a garbage can. For most of this time, the refinery has been the largest source of tax revenue, exercising dominant economic and political influence. Which is a pity, since the rest of the Bay Area embarked on a scientific, technological and economic renaissance that is unparalleled in human history. Now, the era of carbon generated wealth and dominance is in decline, particularly in densely populated areas where growing number of residents are pushing back, protective of their health and well-being. Carbon-generated wealth, usually from extraction industries, is being overtaken by knowledge-based wealth. High-tech workers are transforming the communities throughout the Bay Area. Cities like Richmond that were mired in the death grip of the fossil fuel industry, are now undergoing gentrification and renewal. So where does that leave Benicia? If the pro-Valero councilmembers have their way and Valero’s CBR project is approved, then the city will continue to be dependent on the refinery and the fossil fuel industry.It’s clear from the evidence that crude-by-rail transportation is unsafe, unhealthy, and disruptive, but it won’t matter if the project is approved and the 50-car trains take over the Industrial Park, cutting off access and exit for most of the existing businesses. Once the trains loaded with toxic and volatile Bakken crude start to roll, there will be no “do overs,” and the city’s future will languish. There is no doubt that the fossil fuel and oil industries are in decline. Oil prices are dropping as too much supply hits the market. Renewable energy is cheaper, more plentiful and when connected to smart grids far more flexible and cleaner. Vehicles are getting more efficient and transitioning to hybrid, electric, and hydrogen power. The fossil fuel era with its environmental destruction, social and political upheavals, and corrupt power politics is winding down. So by approving CBR, Benicia will be locked into a decline—all the while the rest of the Bay Area flourishes as the new knowledge-based economy expands. So, if there is plenty of supply, and the refinery’s current crude delivery process is creating substantial profits, why does the refinery still want to ship explosive Bakkan crude by trains through towns that oppose it? And why do they claim it’s necessary to bring it to a loading area with a potential blast zone that includes an elementary school? Admittedly, Valero’s CBR project is not simple. There are key issues at stake, including the tax revenues versus the city’s right and responsibility to protect the health and well-being of its residents. Many people are involved to various degrees in the decision. Unfortunately, the town’s residents can’t vote on the project, since the decision is solely in the hands of the city council. The pro-Valero CBR faction has tried to diminish the importance of the decision by claiming the opposition is simply a ruckus stirred up by passionate environmentalists opposed to Big Oil. The intent is to frame the local election, and opposition to the project, as simply a one issue ballot. But the reality is far different. It’s not merely a CBR issue, or whether the refinery is good or not for the city, but a clear and simple question of what is to be Benicia’s future? Will the city – pushed by the three pro-Valero councilmembers – be locked into fossil fuel’s decline, or will it have the wherewithal to step into the 21st century and join the Bay Area’s booming knowledge-based economy? If Benicia is going to survive as a chartered city, it has to go where the future beckons, which is to the new economy. If it dithers, the city will be passed over, as the new economy leapfrogs to Vallejo and other cities along the Interstate 80 corridor. Three decades in, the scientific and technological Renaissance is just getting started, powered by a steamroller of venture capital. Silicon Valley is awash with cash and opportunity, and the Bay Area’s great universities and national laboratories are brimming with patents just waiting for implementation. High-tech and green tech startups and businesses are growing exponentially each year. Chinese and other foreign buyers are trolling Northern California for the newest inventions and technology. The Green Industrial Revolution will continue to grow, pushing out along the region’s main transportation corridors. Eventually it will extent from Palo Alto to Sacramento. Just as Apple overcame Exxon, the new economy will push out the fossil fuel industry in the Bay Area. Within a couple of decades, the Bay Area refineries will lock their gates, unable to withstand the shifts in the energy markets and the expenses of offsetting carbon emissions. Above all, tech workers have enormous amounts of money that is rapidly changing the real estate market and the Bay Area’s lifestyle. As these workers mature, they will pressure politicians for the things they value, which is certainly not carbon emissions or refineries. Rarely in life does time and circumstance allow us to decide our fate. The future is often veiled and clouded, and usually clarity only comes with necessity, too often calamity. This is true for individuals as well as cities. Cities, especially small company towns, rarely have the visionary leadership and the ability to break loose from the status quo, until like Stockton or Vallejo they implode. Benicia’s fate is remarkably unambiguous; stick with the old fossil fuel industry and go down with its decline, or join the Bay Area’s Renaissance and prosper. Throughout the world, other cities have faced much harsher realities and have been successful in transitioning to a new economy. Melbourne, Copenhagen, Berlin and Bristol leap to mind. In each, change was driven by strong visionaries who understood that change was the best option and who had the leadership skills to pull the cities and their residents forward. Does Benicia have similar visionary leadership? That is clearly central to November’s local election. There are two councilmembers up for re-election—Tom Campbell and Christina Strawbridge. Mayor Elizabeth Patterson is being challenged by Vice Mayor Mark Hughes. Three councilmembers – Strawbridge, Hughes and Alan Schwartzman who is not up for re-election – favor Valero and its CBR project. Mayor Patterson has shown time and again that she understands the dilemma the city faces and why its future lies with the new economy. She clearly has the vision, talent and leadership required to move the city forward, and should be re-elected. Councilmember Campbell also understands that Benicia’s future prosperity can’t be dependent on Valero’s CRB project and he should continue. Steve Young, a new challenger for a council position possess exceptional talent and leadership skills, and clearly understands that the city’s best interests are to reject Valero’s CBR. As a member of Benicia’s Planning Commission, he spent countless hours on the issue, painstakingly doing the research and leading the commission through the pros and cons as each member came to agree that the CBR project was not the town’s best option. Patterson and Campbell were outvoted by the three other councilmembers, and the council failed to accept the Planning Commission’s recommendation, instead giving Valero the opportunity to reopen the issue with the Surface Transportation Board. Cluttering the decision was some questionable recommendations from the city staff, goofy advice from a consulting attorney, and bullying from Valero’s high-powered lawyer. In short, the whole process reeked of the misinformation and strong-armed tactics so common when an oil company puts pressure on small town politics. Given his remarkable dedication to Benicia and the work required to bring the whole CBR permitting process into the public light, Steve Young has clearly shown that he has the intelligence, talent and leadership skills needed to help the city transition away from the past and embrace the future. For Benicia, come the November election, Mayor Patterson and Tom Campbell should be re-elected. Steve Young should be the newly elected councilmember.